Gutters need to slope towards the downspouts in order to function properly. If the gutter is too level, it will hold a lot of run-off water and risk becoming too heavy for the supports to handle. Typically, a section of five-inch gutter that is one foot long can hold up to 1.2 gallons of water, whereas a section of six-inch gutter that is one foot long can hold up to two gallons of water. A gutter that is too level will also collect debris more easily. On the other hand, it’s important that the slope is not too strong. Not only would a strongly-sloping gutter detract from the architectural beauty of your home’s roof, a slope that is too strong will cause the downspouts to become flooded, possibly resulting in the low end of the gutter overflowing. This can cause the erosion of the foundation near the downspout. As gutter overflow is the key cause of basement water leakage, a gradual slope is essential. With these considerations in mind, the recommended pitch is between one to two inches over forty feet. Strong winds, water, and other debris can knock your gutters out of alignment. In addition, your home settles over time and this can affect the original slope of the gutters’ installation. Therefore it is recommended that, once a year, your rain gutters are inspected to ensure they are properly levelled and aligned. Ideally, this should be done just before the rainy season. A simple method for checking the gutter alignment is to pour a one-gallon bucket of water into the gutter, at its highest point. If you notice the water slowing or stopping on its way to the downspout, continue to pour buckets of water until you can isolate where the problem is located. Once you’ve determined where the problem is, you’ll need to identify what it is. Luckily the most common problem – debris buildup – is easy to identify. If the water is slowing down rather than backing up, however, the gutters will likely need to be realigned so that the water is once again directed toward the downspout. 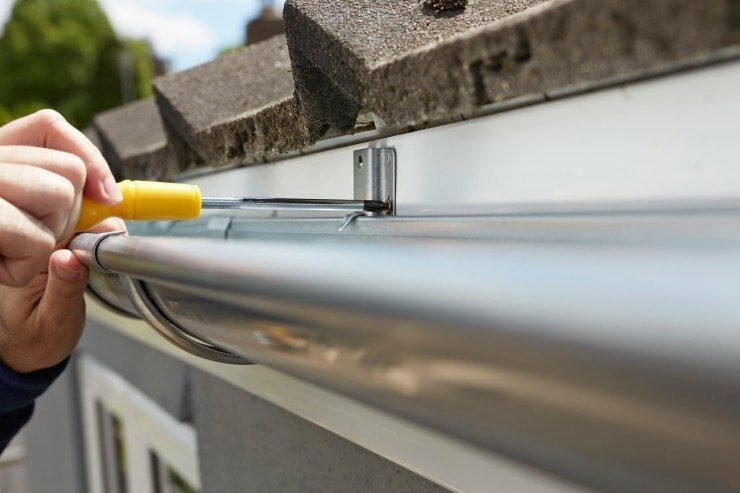 If the gutter has been bent out of shape or is leaning in the wrong direction, you may be able to simply force it back to its original position. It’s also a good idea to check the brackets before and after the affected area, as these could be a source of the problem if they are loose or broken. After correcting the problem, try adding more water to the highest point of the gutter, to check whether or not the water is now flowing correctly. When realigning the gutters, you may find sections that are either broken or bent beyond repair, and need to be replaced. If you have more questions, feel free to contact Rain Gutter Pros Inc. for answers.